Occam was one topic that generated a good deal of discussion. The exhibition took place in parallel with the conference. Discussions took place during the poster sessions. Award winners were selected by organizers Professor Paul Svasta (far right) and Associate Professor Mihaela Hnatiuc (second from right). Alexandra Fodor (Technical University of Cluj Napoca), winner of Best Poster Award, stands between Iulian Nastac (far left) and Andrei Drumea (middle, Politehnica University of Bucharest), who also received recognition for their excellent poster efforts. The final two days were divided between keynote speeches, industrial sessions, plenary oral and poster sessions. The works judged best of show were awarded with honorary certificates. The objective of creating a forum for close industry-university links is to harmonize the training of the human resource with an eye to meeting the near and future requirements of the industry. 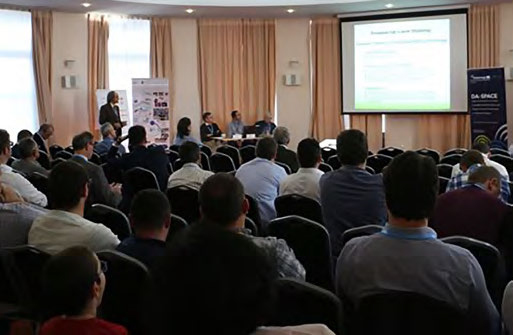 Industry participants accounted for nearly 40% of attendees, a number of whom presented papers of their scientific or industrial research work, including Continental Automotive Romania, BEIA Consult and Syswin Solutions. 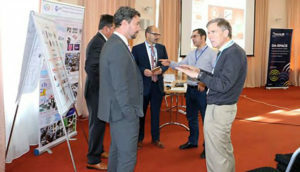 The latter two companies are members of the Electronic Innovative Cluster, ELINCLUS, who, together with other companies, presented at the exhibition section. They are prime examples of the continuous effort of the Cluster’s management entity, APTE, to help to promote the interests of their members, specifically, facilitating contacts, promoting research results, products and services on an international level. The local organizing committee, headed by Associate Professor Mihaela Hnatiuc from Constanta Maritime University, has made a significant effort to help in the success of the conference, including by facilitating a visit through the institution’s laboratories. During the closing ceremony, the general chair, Professor Paul Svasta, emphasized that the SIITME 2017 event was the largest event yet and attracted the most diverse group to date. In closing, Professor Daniela Tarniceriu, Dean of the Faculty of Electronics, Telecommunication and Information Technology from Gheorghe Asachi Technical University of Iasi, and Marian Petrescu, Continental Automotive Romania, SIITME Conference and Exhibition committee member, announced that the next event, SIITME 2018, will be held in Iasi, one of the most beautiful cities in Romania, and one of the four cities where Continental Automotive chose to set up operations. Surely, not accidentally.